Every farm teams wants harmony on their family farm and this book will show you how to get it. You’ll gain insights into how family systems work . The culture of agriculture section is a great primer for urban folks or new farm brides from the city who have not grown up waving to strangers they pass on the road! The book is packed with helpful hints on what the daughter-in-law, mother-in-law, father-in-law, and son-in-law needs . There are toolboxes that you can use immediately to find out what’s working and what is not working for your farm business partners, who also happen to be family. Certified coach Elaine Froese has spent over a decade coaching farm families and her common sense practical approach will empower you to create better conflict resolution on your farm. Co-author , Dr. Megan Mckenzie shares her tools for building bridges and exploring constructive conflict behaviours. The book is peppered with cartoons and stories to make it a fun read as well as informative. The bibliography and index will be helpful to agriculture colleges or your own research for hitting the section you need most. 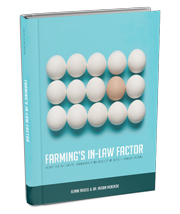 Ultimately, Farming’s In-Law Factor is a resource for agricultural families that is unique and very needed! You are not alone in muddling through the people issues that threaten to undermine your hard work and family business. This book is a tool you need today to help you get more harmony on your farm. This book can be purchased through Elaine Froese or in office at Boys Financial Services.